Will Hayward start when the games count? If not him, who? However you feel about the Boston Celtics and their early showing in the preseason, it's probably safe to say we agree Gordon Hayward wouldn't be starting a regular-season game the way he's played so far. And there's nothing wrong with that; he's coming back from a major injury, after all, and between conditioning and the psychological component, it's probably going to take weeks or even a few months to get all the way back to his old self. For a lot of teams, that could present a major problem, and while it's certainly not optimal, the Celtics are more than equipped to elevate any number of options to fill in for him until that day arrives. The question, however, is...who? This, of course, may end up being a non-issue anyway, as Boston only has one preseason game left against the Cleveland Cavaliers this Saturday, and then have over a week off afterward, not playing their season debut vs the Philadelphia 76ers until the 16th of October. 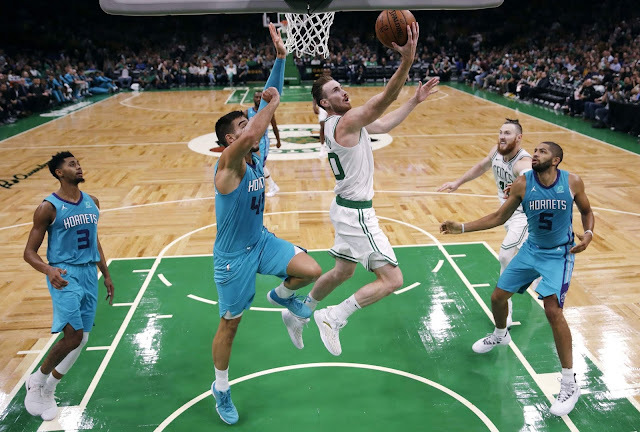 But should that not be enough time to mostly recover, adjustments will need to be made to the anticipated starting five of Jayson Tatum, Jaylen Brown, Kyrie Irving, Al Horford and Hayward - who makes sense to fill in in such a case? Brown and Tatum are more than likely planned to play the two and four respectively, but can play all three positions between their anticipated roles, which opens up a few different paths. Knowing how Brad Stevens likes to tailor plans to the matchup, I imagine we'd see a rotation based on situational need rather than a single candidate taking on the spot while (if?) Gordo needs to time to round into form. Semi Ojeleye or Marcus Smart could make sense from a purely defensive perspective - potentially useful given Kyrie probably also needs time to get into his best defensive shape. As an added bonus, Smart could serve as a "super-sixth man" role, anchoring transitions between the second unit and the starters. Terry Rozier and Marcus Morris could each bring some unique wrinkles to both ends of the floor, but the variability they bring to offense might not be the best choice for a team trying to find its way as a high-volume jump-shooting squad capable of giving everyone who needs to eat shots. My guess, however, is that they give Hayward shot even if he isn't quite ready, and if early results disappoint enough, they go back to starting Al at the four and Aron Baynes at the five, with some experimental small lineups for teams without classic big men. What do you think? Will Gordon be up to the task come October 16th or soon enough after that this won't matter? If not, how does Boston adjust? Let us know in the comments below.